True to detail and easy to hang up, stare at the moon in a lunar fantasy from your very own bed thanks to Moon in my Room by Uncle Milton. Depicting all lunar phases of the moon, this kit comes with 1 remote control and your own moon unit to hang up. 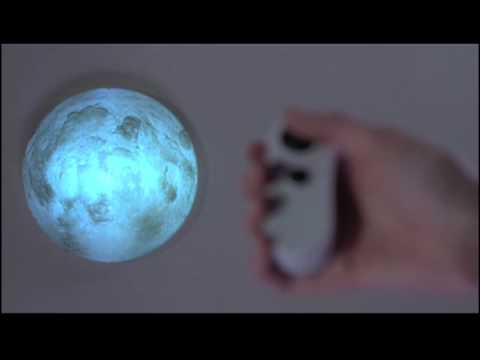 The instruction guide included features details on your infrared remote control allowing you to automatically change the phase of moon; however it also features a manual setting, so you can choose your favorite lunar depiction. Don’t worry about spending a fortune on batteries as thanks to its automatic shut off feature, it allows for maximum preservation of battery life. It's even textured to feel like the moon - as close as you can get to touchin' the moon from your moon! Size: 12" x 3.5" x 11"